Case of ophthalmoplegia externa acuta, probably due to a scrofulous lesion of the pons Varolii; recovery. Berry, Sir George Andreas, 1853-1940. Journal : Edinburgh medical journal ; vol. xxxii. Description : 817-825 p. ; ill.: 2 phot., 2 figs. ; 23 cm. Photograph : 2 in-text autotypes (unverified). Subject : Brainstem — Lesions; ophthalmoplegia. President, Ophthalmological Society of the United Kingdom, 1909-11. President, Royal College of Surgeons of Edinburgh, 1910-12. Senior surgeon, eye department of the Royal Infirmary of Edinburgh. Eponym: Berry's syndrome, genetic mandibulofacial dysostosis. Author caption: ..and Byrom Bramwell, M.U., F.R.C.P. Edin., Assistant-Physician to the Edinburgh Royal Infirmary. Photographs republished in Bramwell, Intracranial Tumours. Edinburgh: Pentland, 1888 (pp. 178-179). Recension: Fox, L. Webster (1887), Ophthalmoplegia externa acuta. Phila: Amer. jour. med. sci. ; vol. xciv. 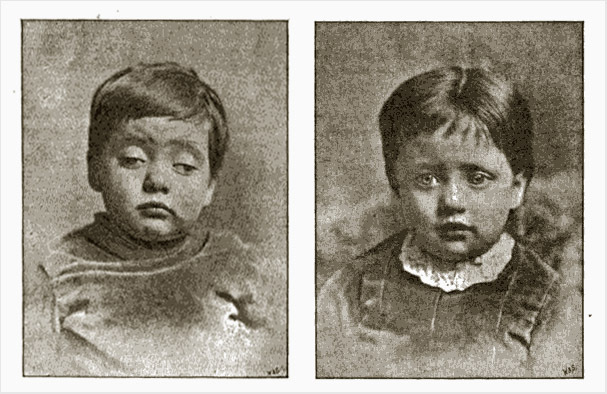 The two autotypes portray the pediatric subject, before and six months after treatment with iodide of potassium for tubercular lesion of the pons Varolii.